Thermoplastic polyamide elastomers (PAE, TPA, TPE-A, PEBA, COPA) are high-performance thermoplastic elastomer (TPE) block copolymers based on nylon and polyethers or polyesters. PAEs consist of alternating hard and soft segments joined by amide linkages. They are used mainly in areas where other thermoplastic elastomers cannot compete or perform, especially at lower temperature. Moreover, PAEs can be processed by the usual melt-processing techniques, such as injection molding, extrusion, blow molding, rotational molding, and thermoforming. PAEs have unique properties of energy return; are lightweight, elastic, and flexible; and impart great impact resistance. Applications for thermoplastic polyamide elastomers include sporting and leisure goods, automotive parts, hydraulic and pneumatic equipment, polymer modification (e.g., as an antistatic additive), wire and cable jacketing and tubing, other electrical/electronic uses, medical applications, and miscellaneous consumer products. The European region continues to be the largest producer and consumer of PAEs, as well as the largest exporter. European exports are destined primarily for Asia and the United States. World consumption of PAE is expected to grow at an average rate of 3–4% per year during 2017–22, driven by fast growth in Other Asia/Oceania and China. Major end uses that will enable this growth include use in sporting goods, electrical/electronics, automotive, and medical applications. The United States is the second-largest global consumer of thermoplastic polyamide elastomers. Growth has slowed slightly in terms of some end-use applications, whereas growth in medical applications has increased. 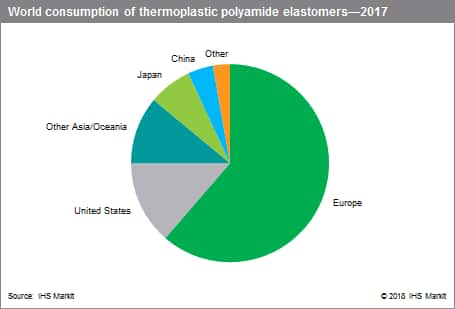 The United States is considered more mature in thermoplastic polyamide elastomers than Europe, where consumption is roughly four to five times larger than that in the United States. As in North America and Europe, in Japan, polyamide elastomers have been used primarily for sporting goods, automotive, and electronic/electrical applications. As the production of automotive and electronic/electrical equipment has decreased in Japan, consumption of PAE for these applications has also decreased. Recently, use in medical applications, mainly for catheters, has increased, which has offset the decrease in consumption. It is expected that PAE consumption in Japan will not grow much in the near future. In Other Asia, consumption of PAE has been increasing because of increased manufacturing of automobiles, electrical/electronic equipment, and sporting goods. It is expected that consumption in Other Asia will increase at a high growth rate of 8% per year in the next five years. Among the different types of thermoplastic elastomers, thermoplastic polyamide elastomers are still at a very early stage of development, with relatively slow growth in China. There is only one PAE producer with nameplate capacity in China. Almost all demand for PAE is satisfied by imports from the United States and Europe. Compared with Europe, there are limited downstream applications in the Chinese market, and they are mainly distributed in the electrical/electronic domain.